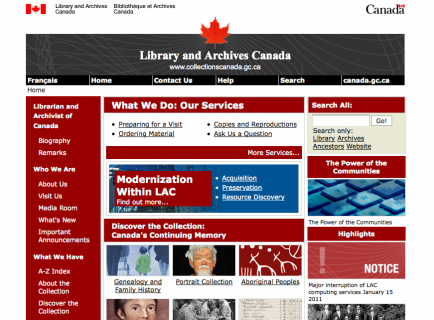 Library and Archives Canada (LAC) provides you with several electronic research tools which make access to its collection easier. AMICUS and ArchiviaNet are the two major tools. A database of catalogue information about books, periodicals, music, videos and other published materials. Provides access to LAC's archival databases comprising references to records from governmental and private sources, including textual records, maps, works of art, photographs, videos and films, sound recordings, architectural drawings, stamps, medals and globes. For family history research, consult Sources by Topic for information about records relating to immigration, land, census, births, marriages and deaths, etc. An icon identifies those databases that are available in both the old "ArchiviaNet" and the new "Archives Search". You will continue to have access to LAC's archival databases comprising references to records from governmental and private sources, including textual records, maps, works of art, photographs, videos and films, sound recordings, architectural drawings, stamps, medals and globes.